We're in for an intriguing finish at the bottom of the Premier League next Sunday after this weekend's games. Hull are in deep trouble after losing 2-0 at Tottenham, but Newcastle are by no means safe after their 2-1 defeat at relegated QPR. Aston Villa are safe, though, despite a 6-1 hammering at Southampton, as are Leicester after a 0-0 draw at Sunderland, who still need one more point. It was an emotional weekend too, as Steven Gerrard played his final home game for Liverpool, who were beaten 3-1 at home by Crystal Palace. 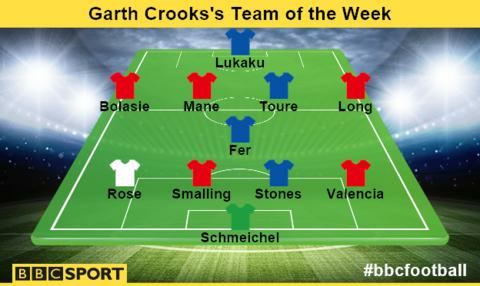 Here are the players who I thought excelled and have earned themselves a place in my team of the week. I nearly changed my mind after Manchester City keeper Joe Hart's superb save from Swansea defender Federico Fernandez's header on Sunday - but I've gone with Kasper Schmeichel. His save from Sebastian Larsson's free kick and then another from Adam Johnson later in the match gave you some indication of why Leicester have kept five clean sheets in the last six games. I have been very impressed with the way Schmeichel has acclimatised to life in the Premier League. He has slowly worked his way up the leagues and into the big time where he has coped with the pressures of being at the bottom as well as anyone. If you are a goalkeeper and have the name Schmeichel, a lot is expected. The last time Manchester United met Arsenal at Old Trafford was in the FA Cup, when Antonio Valencia's back pass allowed Danny Welbeck to seal the tie. There were no such mistakes from the full-back during Sunday's 1-1 draw. The Ecuador international was as solid as a rock and full of running against a very dangerous Arsenal side. It will be very interesting to see if Southampton's full-back Nathaniel Clyne joins United's ranks in the close season to bolster a position Valencia has made his own. It is clear that some sides cope with European football better than others. Everton seem to be one of those teams who found the Europa League challenging. However, there is one player who looks to have benefited from the experience and that is John Stones. The defender's performance during Saturday's 2-1 win at West Ham demonstrated how much the game time has helped him. Against the Hammers, he made important blocks when he needed to and showed tremendous composure when he had to. A player developing fast. It hasn't gone unnoticed that in the absence of Wayne Rooney, Manchester United manager Louis van Gaal made Chris Smalling his captain against Arsenal. The armband probably says more about the development of the centre-back and the future role he has to play at Old Trafford. His performance against the Gunners was consistently high but what is becoming glaringly apparent are his leadership qualities. Perhaps England manager Roy Hodgson might start thinking about Smalling in this area too. He may well hold his mouth in embarrassment. Having beaten Hull's offside trap, the Tottenham full-back miscued his volley and completely fooled goalkeeper Steve Harper as a result. Danny Rose loves to get into attacking positions and added to his goal tally against a desperate Hull as a result. Rose also heaped more misery on Steve Bruce, who not only has to cope with the enforced absence of Jake Livermore but now faces a win-or-bust match against Manchester United on the final day of the Premier League season. How QPR could have done with Leroy Fer during that crucial period before they were doomed to the Championship. His second-half strike and all-round performance against Newcastle were brilliant. It will be very interesting to see whether Chris Ramsey can keep the Dutchman at Loftus Road and help the Hoops back into the Premier League. He's definitely one of the few players worth keeping. Some pundits have suggested, wrongly in my view, that Yaya Toure is past his best and surplus to requirements as Manchester City start their rebuilding programme next season. They may have a point about pastures new but the way he strolled through Sunday's 4-2 win at Swansea and still managed to destroy the opposition suggests he far from past it. Manchester City need to be very careful not to let Yaya leave the Etihad Stadium and fall into the hands of their fiercest rivals. I can assure City that they are watching this situation very closely. Shane Long assisted the final goal of Sadio Mane's hat-trick against Aston Villa with some wonderful play on the left, and got a return for his efforts when he added a nice little tap-in himself a few minutes later. But it was Long's second goal that captured everyone's imagination. Having stolen the ball from Ashley Westwood, the Southampton man saw Villa keeper Shay Given off his line and sent a beautifully curling shot into the top corner of the net. Absolutely superb. This lad was electric. Three goals in three minutes for the Senegalese striker says all you need to know about the impact this player had as Villa were demolished. Having said that, I am still trying to work out which team turned up at St Mary's because it didn't look anything like the Aston Villa I was raving about last week. Former Blackburn Rovers striker Chris Sutton said on Final Score that he thought that Mane had proved himself worthy of a move to a big club next season based on his performances. That's the last thing Saints manager Ronald Koeman wants to hear. Yannick Bolasie struck the bar and provided the assist for Wilfried Zaha to score a decisive goal as Crystal Palace won at Anfield. And Bolasie might have scored a couple of goals himself as he ripped through the Liverpool defence almost at will. Palace may have provided Steven Gerrard with a guard of honour to mark his last game at Anfield but that was the only thing Alan Pardew and his team gave Liverpool or their captain all evening. What a second half of the season for Everton and Romelu Lukaku. The Belgium striker, along with his team-mates, have battled their way through a difficult period and look more like the team who finished fifth last season. Lukaku could have had a couple of goals against West Ham but in the end had to settle for the one - which was the winner. The striker's confidence has returned along with that of his team. So why are some Everton fans picking chairman Bill Kenwright out for criticism? He paid £28m for Lukaku, who helped to get them into Europe. What more do they want?